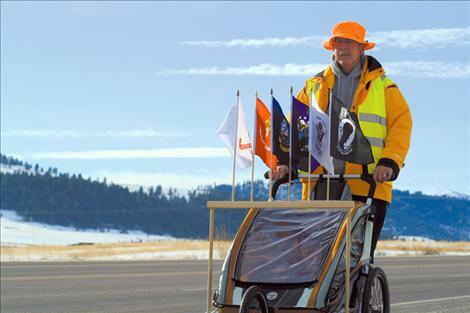 Decked out in bright reflective clothing, Ronan resident and Marine veteran Chuck Lewis trains along U.S. Highway 93 in preparation for his 3,300-mile walk across America. 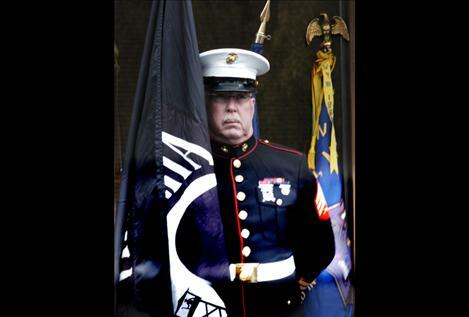 Marine veteran Chuck Lewis of Ronan volunteers with local honor guards at funerals, parades, and other veteran-related events. 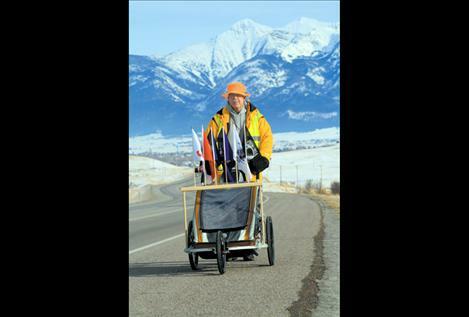 Lewis’ stroller, containing all his equipment and displaying a flag from every branch of service, rolls unattended down Ravalli hill toward St. Ignatius. MISSION VALLEY — The American military is unlike many other militaries in the world. It is 100-percent volunteer. This means that those who serve make the honorable, selfless and noble choice to put themselves between the bullets and the rest of us — and they do it of their own free will. Even if you don’t support the war, “I support the troops” seems to be the popular thing to say. If you stop someone on the street and ask, “Do you support the troops?” you will most likely get a surprised look and some variation of the phrase, “Of course, don’t you?” If you ask the followup question, “How?” most have no answer. 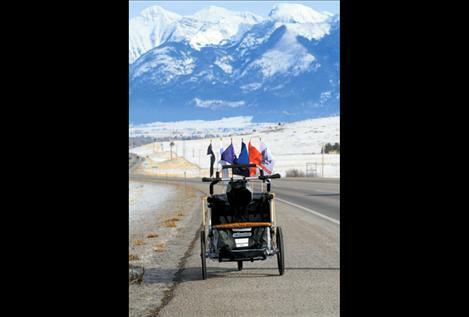 A Veteran and member of several VFW posts and honor guard organizations throughout the Mission Valley, Lewis has planned an epic cross-country journey to raise money for wounded and disabled veterans. In about two months, he will leave Ronan to walk more than 3,300 miles across the United States. Last summer, the 61-year-old Lewis was hit with a severe case of vertigo and couldn’t walk in a straight line or stand upright. While he said he feels much better now, Lewis hasn’t fully recovered. “Google says it’s 3,300 miles, but I’m wondering if it might be closer to 3,400 because I still don’t walk straight,” he said with a laugh. His journey will begin in Seattle, Wash., and end at the Vietnam Veterans Memorial in Washington, D.C. It will take Lewis roughly six months to complete the journey while he travels through Washington, Idaho, Montana, North Dakota, Minnesota, Wisconsin, Iowa, Illinois, Indiana, Kentucky, North Carolina and Virginia. The trek’s cause is twofold: Lewis hopes to remind people across the country of the cost of freedom by offering presentations and workshops at speaking engagements and interviews during the walk, and raise $50,000 for wounded and disabled veterans programs. He added that the idea for the trip wasn’t just about raising money, it was also about the support he will get along the way. Lewis made a website, www.WalkingForTheFallen.com, where people can track his progress along the route, donate money, offer support and supplies or simply wish him well on his journey. He’s already gotten several offers from friends and total strangers alike from across the nation for food, a shower and place to stay for a night. He will be 62 years old when he sets off at the end of March. To train for the massive undertaking, Lewis walks several miles a day with all his supplies, but he says he’s no stranger to high-intensity training. In his late 40s and early 50s, Lewis competed in 100-mile ultra-marathons. “If you’ve ever done any sort of running, you know there’s two basic methods: you can train short and fast or long and slow,” Lewis said. In his youth, he had a “fair amount of speed” and used that mentality to train short and fast, running long distances in short timeframes. This carried through to his ultra-marathon training. On a given weekend while training for a 100-mile race, Lewis could be found running 30 miles on Saturday and around 20 the following Sunday morning. When people ask him, “How do you train for a 3,300 mile walk?” Lewis responds, “I look at it as 3,300 one-mile segments. I plan to walk about 25 miles per day, but I picked the course and it’s all downhill,” Lewis said with a laugh. Veteran Homer Courville said Lewis has been active with not only the American Legion, but the Mission Valley Honor Guard as well. Fellow veteran, honor guard and VFW member Bob Bell said he knows exactly how Lewis feels. In 2007, Bell, along with five other veterans, traveled to the four corners of America on four motorcycles and a trailing car to support the troops.